The Best Tattoo Black Ink: Make Your Tattoos Leave a Lasting Impression. The tattoo black ink is your ace in the hole. It is the foundation of most tattoos. It makes sense to choose the best product for the job. It’ll make the difference between well-defined artwork and a piece that fails to deliver. Why Should You Use Black Ink? What Should You Look for in a Tattoo Ink? We always like a manufacturer that is willing to back up its products. That is exactly what you’ll get with this one. It has a solid reputation in the industry, so you can certainly add these products to the ones you consider. It gives you a baseline from which to start. Millennium Moms has a great reputation in the industry with the experience to back up its products. It is a favorite of tattoo artists which means a lot since we are partial to the ones that are battle tested. We also liked the fact that it is a USA-made product. The company prides itself on its consistent products. Whether you’re creating your own tattoos or are in business to provide them, consistency is huge. And that’s how you build a good reputation. Remember how important of a consideration it is? 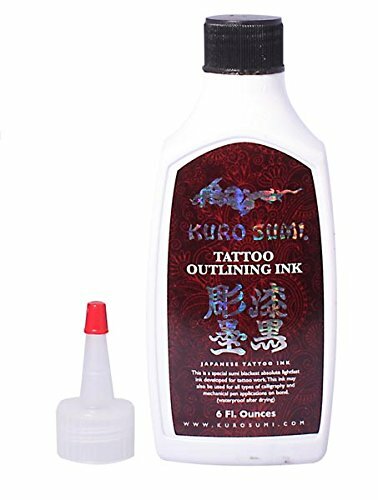 The Kuro Sumi Tattoo Ink bills itself as an organic and vegan tattoo ink. We’re not sure about how these traits apply to inks, but we liked the fact that it relates to the things that matter to their customers, always a plus. It is a rich, dark ink that is a solid performer for a variety of uses. Like Millennium Moms, the company takes pains to ensure customers that it is an authentic product. We liked the fact that they go that extra mile to reassure buyers by calling out bogus labels and listing authorized dealers. We were also impressed with reports that tattoos heal quickly. That speaks to its claims of being sterile. That fact alone saves a lot of time and effort. The Kuro Sumi products are also made in the USA. While it specifies outlining, you can use the Millennium Moms Black Pearl Outlining Tattoo Ink for both outlining and shading. That adds to its value as an ink. It handles like a high-quality product, delivering rich, dark color. There are isolated reports of poor performance mainly due to problems with shipping. We were willing to set those aside given the strength of its reputation and overall reviews. The company prides itself on providing a quality product. We liked the fact that the company is forthcoming with its ingredients list. Since allergic reactions are the most common cause of complications, we appreciated knowing what the product contained so that we could inform clients ahead of time. A company that brags that it is the safest and most sterile ink is setting a high bar for itself. 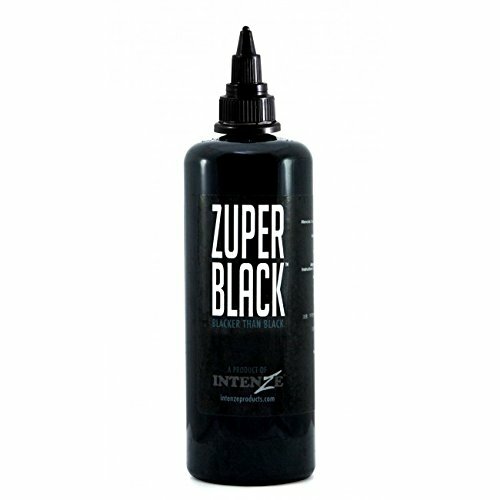 TheIntenze Professional Tattoo InkZuper Black has the reputation to back up its claims. 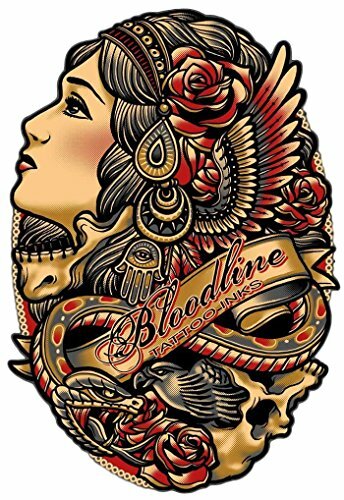 As its name suggests, their products include inks with rich, dark colors that make tattoos pop. And you have to respect a company that calls itselfIntenze because that’s exactly what we want when choosing the best tattoo black ink. It is a versatile product that you can use for a variety of applications. We like a product that has multiple uses to save us some cash. This product is no exception. It handles well, delivering a good application experience. You have to like a company that delivers on its promises for a good product. On the downside, there are some reports of packaging and shipping problems which are outside of the product itself. 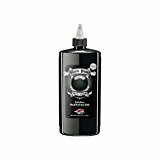 The Skin Candy Tattoo Ink is an all-purpose product that you can use for a variety of applications. You will need to thin it, depending on the use. 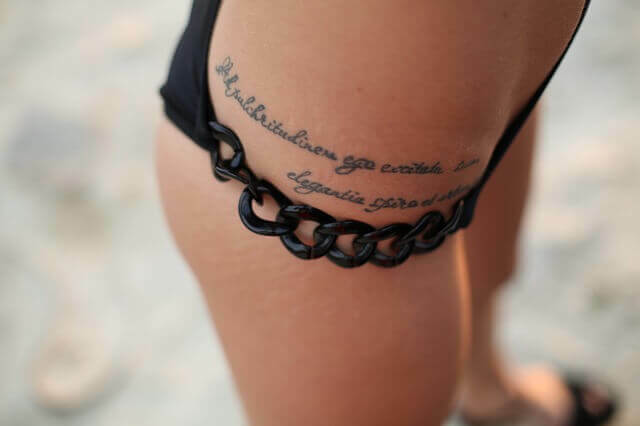 We didn’t think that was a deal breaker, but rather added to its versatility as a tattoo black ink. You can use it for outlining and shading or stick/poke. That’ll mean you’ll need to work with this ink to make sure the mix is right for the application. We like to bring our own vibe to projects anyway, so no big D. The manufacturer has a good reputation in the industry with products that are hassle free, a big plus in our books. It handles well and holds its color well which means satisfied customers. And that message comes through with many positive reports of good, strong color. Buyers will appreciate its reputation for consistency. Americans spend over $1.6 billion annually on tattoos. When you crunch the numbers thatmeans about 45 million people have at least one tattoo. Using the best tattoo black ink is a wise business decision if simply because of the opportunity for repeat business. Often, people choose to get one because it has a special personal meaning. It empowers them. But the reputation of a tattoo parlor also plays a large role in their decisions. Nearly 50 percent rank it as the most important consideration. The products you use are part of that mix. You know the scenario well. A guy—or gal—comes into your shop to get their first tattoo. Maybe they know a bit about the process or have a friend that has one. You know all the basics about running a reputable business and making it safe. Quality products back up your brand. Many tattoo inks stand out because of the proven reputation of the manufacturers. They provide quality products with safe ingredients. And they are the real deal. With imitation and fake products out there, your clients need to know that they can trust you to use the best. Many people may not know that the FDA doesn’t regulate the industry but rather leaves that bit up to local authorities. You are in a position of trust. You should provide a good product to get that repeat business or referrals. So, now let’s talk about the best tattoo black ink. The first thing to consider is the manufacturer. Artists will have their preferences. The good companies will stand out. You’ll see it in reviews of the products and the ink that people get. Good or bad, the word gets out. Follow it to see where it leads. Safety is probably the most important factor when choosing an ink. The consequences of a tattoo gone wrong are too high to mess around with unproven products. Since many products have proprietary formulas for pigments, you must rely on quality. This video from Expert Village explains how to take care of your tattoo to keep it looking as great as the day you got it. The steps you take from the beginning will avoid problems with complications that could take away from the joy of making your statement to the world. Take a look at the ingredients if the manufacturer lists them. It’s best to know what you’re working with upfront so that you can work around possible issues. It’ll also help you make the experience of getting a tattoo better for your clients. It can help prevent common things like allergic reactions. Tattoo black inks aren’t all the same. Some are better for outlining rather than shading. Other products are good for both things. The product label will typically provide this information. When you know how to use a product right, you’ll avoid problems down the road. Things you’ll want to consider are the applications for which you use it. For personal use, a product for stick and poke is fine. You should avoid an ink that is too watery to keep your design intact. As someone in the know, you are aware that ink varies even within the same hue. Shades may differ between manufacturers and different product lines. And it can even vary with standard colors like black. That’s why it’s important to see it in action for yourself. In addition to shade, the consistency of the product is essential. As you know, there will be individual differences between clients. Tattoos happen. The best tattoo black ink will deliver what you expect—true color that doesn’t fade. Some colors will lose their vibrancy over time. Since you’ll use it as an outline ink, it’s critical that the color stays put. That’s often the foundation of any tattoo. You also should consider your clients. To get the most use out of an ink, it should perform well whatever the tone of the canvas with which you’re working. Consider the final product as well. Your art will look its best with colors that are strong and offer good coverage. Think about how it flows too to make your work easier. It should flow smoothly and evenly for best results. To get the most out of your purchase, you should look for certain buzzwords in product descriptions. These are the things that appeal to users whether it’s someone doing their own stick and poke or a professional tattoo artist. Vibrant colors are a top priority. You want to get the job done in one application. It’ll appeal to both newbies and old-timers in the tattoo circuit. It’s also a way to ensure a high-quality tattoo. Other buzzwords will speak more to the business owner than the individual. Counterfeit products present a threat to both customers and businesses. Reputable companies will take measures to assure both you and the customer that the product is genuine. You’ll find companies that use special labeling to ensure quality and are open to customer inquiries. After all, it’s just as important to the manufacturer as it isto the tattoo artist. It’s only with a genuine product that you can safely put your reputation on the line. Did we say how important reputation is to a business owner? That’s why you need to pick the best ink for the job.